Thomas Edison said that genius was “1% inspiration and 99% perspiration,” and anyone who has gone through the process of turning their epiphany of a great idea into the reality of a viable business, can attest to that, as there are tons of pitfalls along the way. Unfortunately, a good business plan can involve a ton of perspiration, due to the detailed planning that can easily overwhelm anyone; even more so a neophyte. Business plans are essential to secure funding for fledgling businesses, including even getting a firm off the ground, or expanding an existing one. Any loan officer will ask to see a business plan before making a loan, and it can easily show how serious the applicant is about their business. Solid business planning software can definitely assist with the creation of a business plan, providing hand-holding along the way to structure the process. Let’s look at some great choices for business planning software to get your business going, without you having to break too much of a sweat. Bizplan is the online business planning tool that claims usage of 30,000 startup founders from the Startups.co platform. They use a guided creator that can break the big project down into the component pieces that get tracked with a Progress Tracker, and expert guidance each step of the way including templates that can be dropped in, and completed, along with simple integration of visuals along the way. Additional resources are also provided via the Bizplan Academy, with lessons on relevant topics, for example, “Building a Brand: How to Tell a Powerful Brand Story,” and “Critical Path Your Way to Higher Revenues,” among the many offerings. Those that need even more assistance also can take advantage of an expert consultation from a financial expert that starts at $999. Plans start at the aptly named “Starter” tier which has a brief seven day trial period, and then is $19 monthly, but only supports a single company and user. The next tier up is the “Business” tier, which supports up to 5 companies, and unlimited team members for $29 per month. PlanGuru is a comprehensive, and powerful software package in the business planning space. Education is provided via a series of case studies at their ‘PlanGuru University,’ and a whole slew of video tutorials. The feature set includes flexible budgeting that can handle a simple small business, or a larger multi-department operating budget, and financial forecasting that uses multiple methods, including intelligent and turn-key methods - twenty methods in total. Historical results can also be imported with the general ledger import utility which can then applied to produce a rolling forecast. They also offer PlanGuru Launch, a service to bring in expertise that starts at $250 per hour of assistance. A significant downside is the cost, with the least expensive plan costing $99 per month, which only includes a single user, and additional users cost $29 each per month. While there is no free trial, PlanGuru does offer a 30 day money back guarantee. Enloop is a great choice for business planning software for the cash strapped business as it is the rare offering that has a free tier. Step up up to the next tier, and this is no barebones product, as it has over 100 currency symbols, can automatically generate bank-ready financial reports, and even has automated text writing that can sync with financial data to turn it into text. There is also a real time performance score assigned, that dynamically changes as the business plan is strengthened. The plans start with the Free tier, which is limited to a single business plan with simple text, no images, and does not offer any advanced features. The next plan up is the Detailed plan, that for $19.95 monthly supports two business plans, and offers a significant 55% discount when paid annually, making it even better value. LivePlan is business planning software that offers a simple pricing scheme as there is only a single plan to choose from. As they have a 15 year track record, they offer a clean and simple interface, that can create business plans that look like they were done by an expert consultant, and the software includes a live dashboard that can track day-to-day performance. Those with writer’s block will benefit from the over 500 included sample plans that can be turned to for inspiration. Rather than complicate things with too many tiers to choose from, LivePlan only has a single offering for $11.66 per month if paid annually, or $19.95 per month on a rolling basis. Business Sorter promises to simplify and speed up business planning,and claims to be able to flesh out a plan in an hour or two, via a novel 273 card sort system that covers many common situations. The ability to reword cards is included, or also to add cards to the already expansive deck, so no worries if there is not a pre-made card for your situation. Unlike some sites that have videos, the educational resources here are provided as PDFs and Word files, which can be quicker to access, but harder to follow for some learners. The lowest tier plan, Basic, starts at $10 monthly, with an annual discount of $80 on an annual basis, is fully featured, and includes up to three team leaders. We've only covered some of the most popular business plan software platforms out there, but there are a number of other notables worth mentioning, plus a wide variety of providers of business plan templates. Below we'll briefly cover a range of some of the additional options out there that are worth considering to get your business plan right. Go Business Plans is more of a consultancy than a software solution, but is worth mentioning for the simple fact that it's one of America's biggest business plan companies. While software might be able to do the job for you, if you're looking for significant funding, it's probably useful to get some professional advice, not least in terms of strategic planning, feasibility studies, and financial projections to ensure you have a solid base for your business plan. Wise Business Plans provides a very wide range of templates to work from in constructing a business plan. These are particularly designed with funding in mind, no matter what kind of business you run. What is especially helpful is that Wise doesn’t simply deal with business plan templates for a diverse range of business types, the company also provides plan templates for franchises and non-profits. Plan Writers is another bespoke service that essentially listens to what you want and then puts the plan together for you. Again, this technically falls outside of business plan "software", but the chances are you'll use a software package as a platform to build from, and Plan Writers can then help you build up from that base. Business Plan Pro really is a business plan software platform, and one of the biggest selling ones over the past decade. What works particularly well here is that there are a huge number of plans and templates to start from, with additional support for planning financials and consultancy services on top, if required. The company also provides customers with access to a number of books and survey data sets, which offers additional value to the product. Bplans is another provider of business plan templates, but goes beyond that with additional pitch and SWOT analysis templates. There are also business plan guides, industry reports, and a free course on writing a business plan. 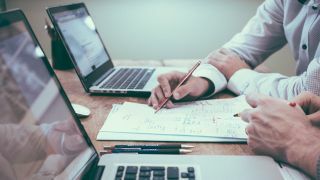 Bplans also publishes a lot of free-to-use articles on business planning, financials, and tax reporting, to help ensure you can keep your figures and projections accurate and compliant.